Black Panther: It's Not a Movie. It's a Revolution. And Ryan Coogler is back at it again (in my Damn Daniel voice) with another BOMB (Black-Lead) motion picture! This movie has easily become one of the biggest silent movements in the last decade or so. And NO, I’m not taking away from the Black Lives Matter movement! I mean this in terms of bringing people together to celebrate the beauty of African and Black culture, and through entertainment nonetheless. Hold up… Not to mention, this is the very first superhero movie featuring a predominantly black cast, production crew, and director! THAT. IS. HUGE. Not to mention the release date being during Black History Month to give it even more meaning. People look to superheroes to be inspirational role models. But to be honest we as a Black community haven’t really been able to see superheroes that look like us in major motion pictures. Heroes -- definitely. But action-packed superheroes for our kids to look up and say “Wow, (s)he looks like me!”, not so much. But Coogler has brought us just that. T’Challah, King of Wakanda, has easily jumped into all of our hearts as a strong, proud, passionate and determined leader who will stop at nothing to do what is right for his people as a whole. 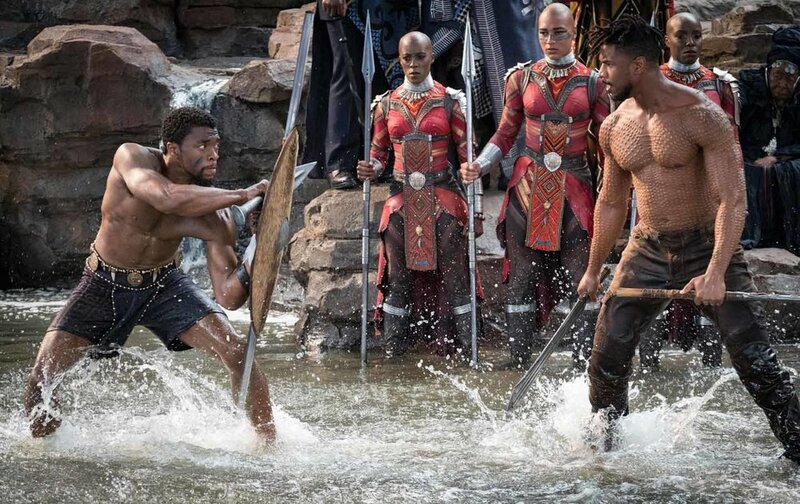 From jump, the cast makes it known that we will be witnessing an African superhero (played by Chadwick Boseman) that is fully in control and ready to take on the world (family included) at any cost while being as calm and cool as the other side of a pillow. Boseman does such a phenomenal performance fully embodying a strong leader to the point that I'd literally address him as king in passing on the street. Not to mention how we appreciate the depiction of such a strong supporting Black female cast! (Spoiler alert coming!) Lupita Nyong'o, who stars as the female lead and T’Challah’s love interest Nakia, does an amazing job being a loyal and head-strong individual who in turn saves T'Challa's life. Letitia Wright is cast as T'Challa's younger sister, and the brains of the operation. From all of the King's tech to the healing of the injured, she without-a-doubt keeps Wakanda as strong as they have become. Then there is the almighty General Okoye, played by Danai Gurira! She is fierce, strong, bold, fearless, smart, THE protector and so much more! She is the epitome of a strong black woman and was an absolute pleasure to cheer on in the theater! Did I mention she is the leader of all female warriors who serve and protect the King at all costs? Yah, badass. Read Danai's full interview with Michel Martin here. Lupita Nyong'o recently stated, "Black Panther could unite Americans and perhaps the rest of the world. ", and she was right on the money. This film has united us in the way Harry Potter and Star Wars united Caucasians. I know that may be a little forward, but let’s be honest -- When have Black people ever dressed up wearing capes with wands, or going full on Anakin Skywalker (Darth Vader) to the movies? Not happening. THIS IS OUR STAR WARS DAMMIT. DON’T TAKE THAT AWAY FROM US! MAJOR KEYS OVER HERE! 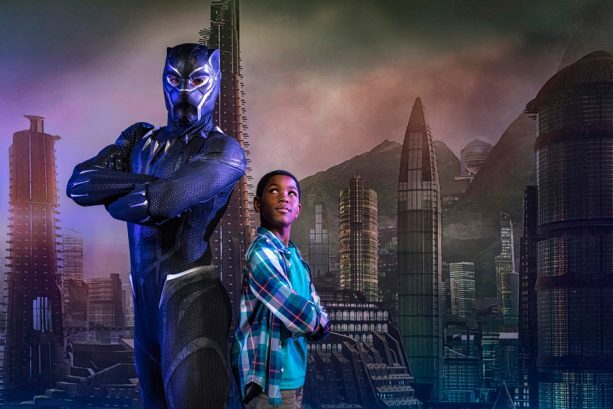 It’s sentiments like these which conclude why African Americans all over the world are proudly saying, “WAKANDA FOREVER!” To some this may not seem that big of an ordeal. But when the former (not to us) First Lady of the United States of America tweets to congratulate a cast for doing a phenomenal job, we jump for joy. In closing of my appreciation for this film, I truly believe that there could be a huge difference in the way the world views us as a culture if more of these depictions existed. A lot of times we are brought to look in good ways, but the sad majority is the reverse. Too much negative actions of our people are splashed across news stations and articles on a daily basis. Coming together to support this film is the way we should be coming together all day every day in support of one another. Our people and the rest of the world's views would thank us for it. Read on Lupita Nyong’o & Letitia Wright explaining the importance of why Hollywood needs to incorporate more Black artists here https://www.teenvogue.com/story/letitia-wright-lupita-nyongo-black-panther-film-diversity-hollywood.